Some intricate and very interesting bracelets have been the center of many fascinating stories from history. Bracelets possess the advantage of being able to be set with large gemstones and in elaborate or intricate designs. 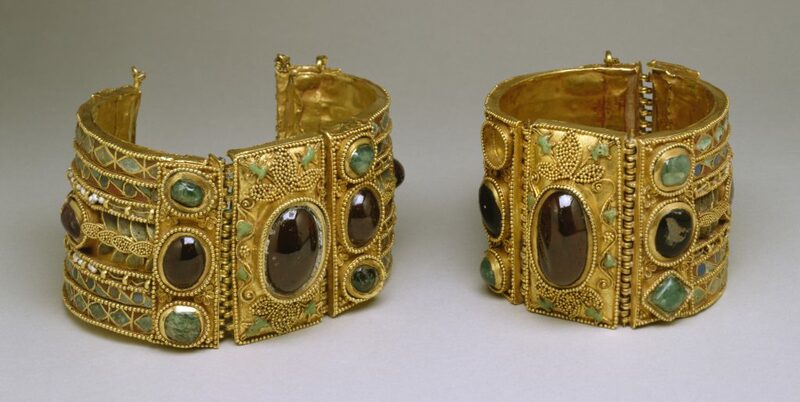 In the following anecdotes from history, the gems may be magnificent, but the bracelets made the showcase possible. 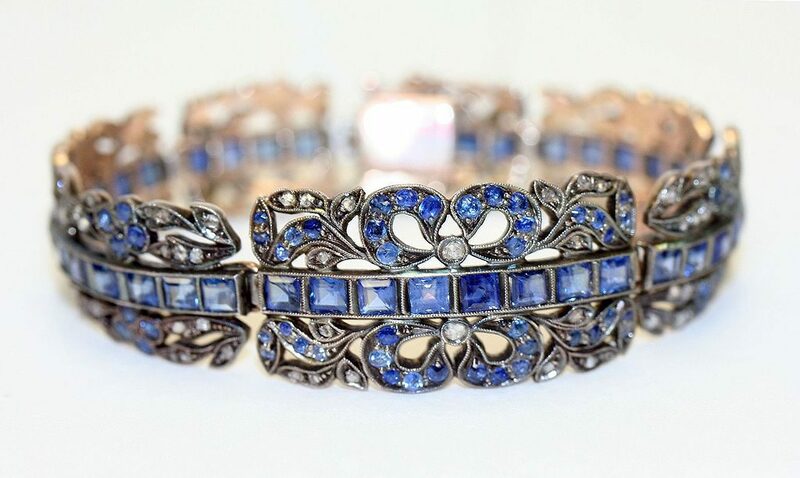 An Austrian-made gold, diamond, and sapphire bracelet from the 1830s. 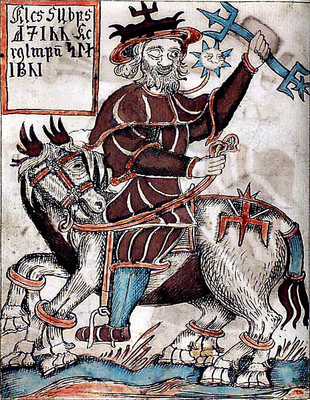 A depiction of Odin riding Sleipnir, his eight-legged horse, from an 18th century Icelandic manuscript. Odin, the chief god in Norse mythology, is associated with wisdom, war, magic, poetry, and the hunt. Odin possessed a golden arm ring, called Draupnir, a source of never ending wealth. It had the power to produce, every ninth morning, eight more gold rings identical to the original. The fabrication of Draupnir is part of the legend. 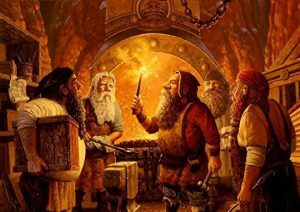 Draupnir was forged by two dwarf brothers, named Sindri and Brokkr, as part of a wager with Loki, a ship-shifting trickster. While Sindri worked magic, Brokkr worked the bellows so that the fire would maintain the correct temperature. A depiction of the dwarves, Sindri and Brokkr, casting Draupnir in the fire. Meanwhile, Loki tried to influence the outcome by changing into a fly and repeatedly biting Brokkr to distract him from his work. Two items were successfully forged: a golden boar and the Draupnir. However, a third item, a Mjolnir, or hammer of Thor, was made with too short a handle. Although it was once part of an armband, the Darya-e Noor diamond is now set in a brooch. 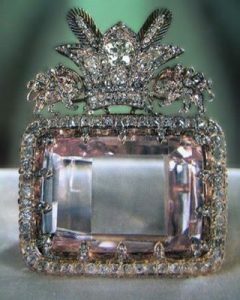 The Darya-ye Noor diamond, also called the “Sea of Light,” is a large, 182-carat, extremely rare pink diamond. It was mined from the ancient Golconda mines of India and it is considered one of the oldest diamonds known to man. A drawing of Nader Shah of Persia. The diamond was owned by a succession of Mughal emperors, the dominant power in India in the 16th and 17th centuries. 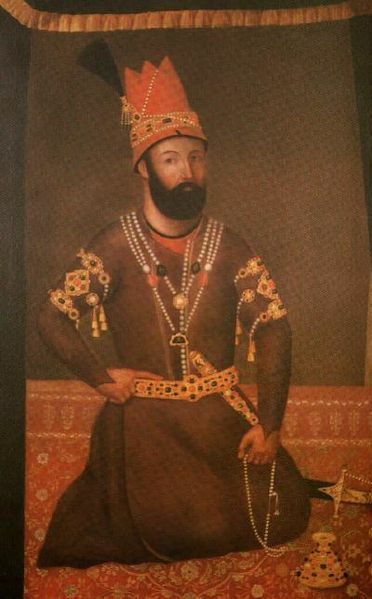 In 1739, Nader Shah of Persia sacked Delhi and carried away the Darya-e Noor as part of his booty. After Nader Shahs death in 1747, the diamond was passed among the successive rulers of Persia. There is some speculation that the Darya-e Noor was once part of a larger pink diamond from the throne of the Mughal emperor famous for building the Taj Mahal, Shah Jahan. Evidence suggests that the large diamond from the throne may have been cut into two pieces, creating both the Darya-e Noor and the Noor-ol-Ain, which is now the centerpiece of a spectacular Iranian tiara. 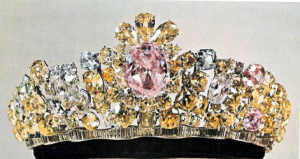 The Noor-ol-Ain tiara contains a 60-carat pink diamond. The tiara was designed by Harry Winston for the occasion of the Empress Farah’s wedding to the last Shah of Iran, Mohammad Reza Shah Pahlavi. Nasser al-Din Shah Qajar (1831-1896) apparently believed that this diamond adorned the crown of Cyrus the Great, founder of the Persian Empire. He wore the Darya-e Noor on an armband until armbands went out of fashion. 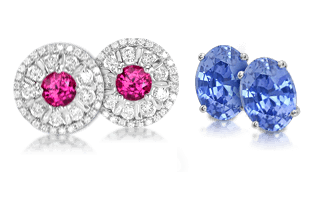 The diamond was then incorporated into a brooch. This brilliant diamond is now housed with other jewels in the Treasury of National Jewels of Iran. Gloria Swanson wearing her fabulous rock crystal Art Deco bracelets. Photo from Diamond Divas. 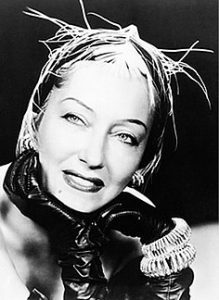 Gloria Swanson was an Academy Award-nominated, Golden Globe-winning American actress who got her start during the silent film era. She was widely enjoyed as a fashion icon and was extremely fond of bracelets. On screen, she retained a lot of control over her wardrobe and brought a particular flare to her presentation, often adorning her wardrobe with beads, jewels, and feathers. As a result, during her heyday, she was one of the most photographed women in the world. 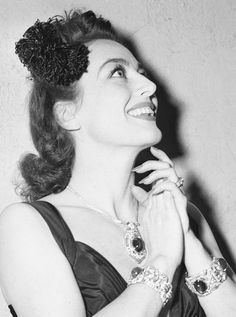 Gloria Swanson’s Cartier bracelets. Photo from Poetic and Chic. 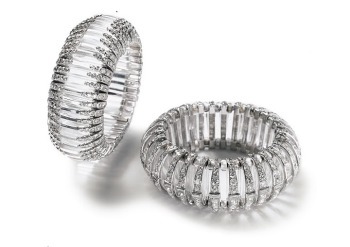 In the 1930s at the height of the Art Deco movement, Gloria purchased two extraordinary bracelets from Cartier. They were fashioned from several dozen semi-circles of rock crystal enhanced with diamonds and mounted on an elastic platinum framework. Joan Crawford wearing her signature blue sapphire jewelry. Academy Award-winning actress Joan Crawford was well known for her fascination with the color blue, painting many rooms in her homes a signature blue color and revealing a fascination with sapphires; so much so that the paparazzi referred to her as “Joan Blue.” One of her favorite sapphire pieces was a bracelet set with three star sapphires of 73.15 carats, 63.61 carats, and 57.65 carats. 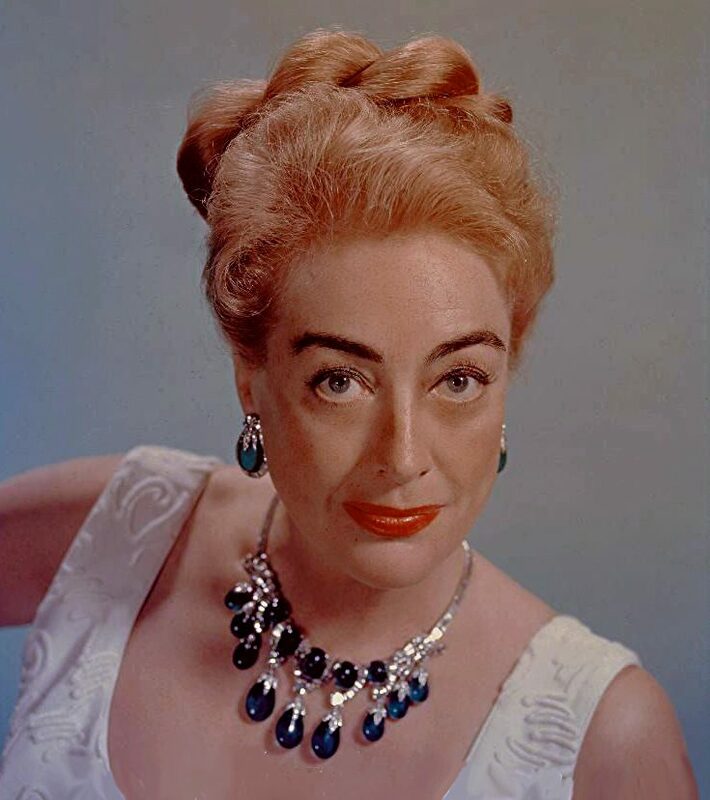 Joan received a 70-carat star sapphire engagement ring from Franchot Tone, her second husband and an actor in his own right. 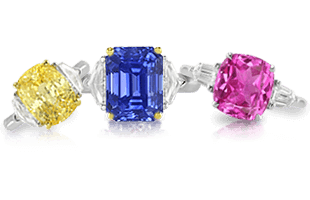 She wore this ring on the same finger as another favorite, a 72-carat emerald cut sapphire. Joan often wore these pieces on a regular basis, never needing a special occasion to don her stunning jewelry. 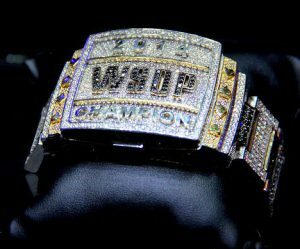 A World Series of Poker bracelet prize from 2014. A bracelet has been awarded in every event at the annual World Series of Poker since 1976 and is considered by many to be the most valuable non-monetary prize that a player can win. Over 1200 bracelets have been awarded in its history, and many players have won two or more. 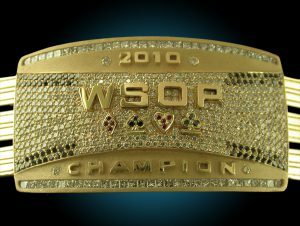 Those who have won the bracelet belong to an exclusive club, and it is heavily desired as a mark of great prestige within the professional poker circuit. 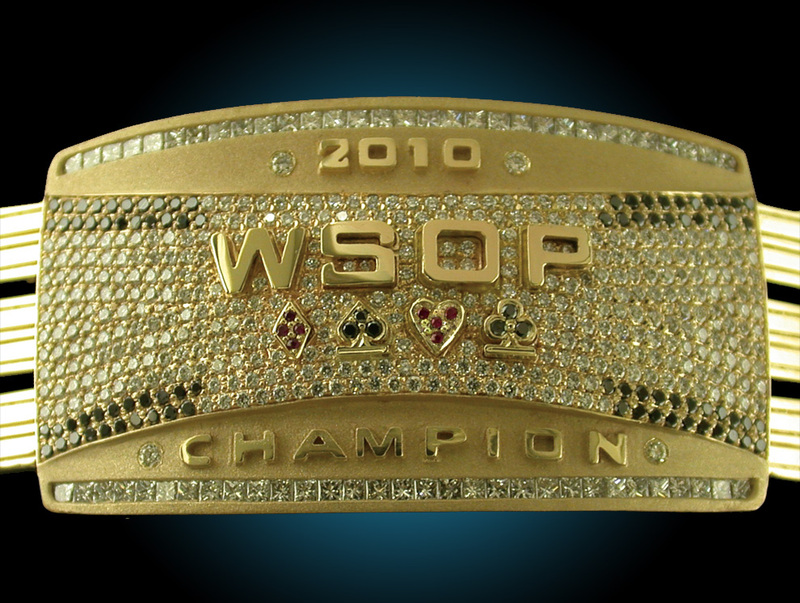 A 2010 World Series of Poker bracelet designed by Steve Soffa. 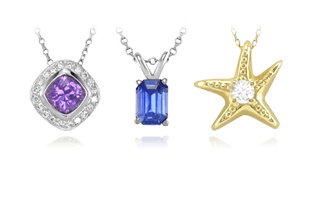 Over the years, many jewelers have taken on the task of designing the bracelet, going to great lengths to establish unique design elements that focus on implementing rubies, black diamonds, and sapphires to represent the various suits in a deck of cards. 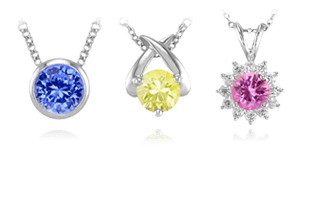 Cast in solid precious metals with features of diamonds and other precious gemstones spelling out “World Series of Poker,” the bracelets are rarely worn but coveted just the same. The bracelets carry with them a sense of history and honor in the sport that is recognized worldwide. As we continue with the exploration of types of jewelry and their settings, learn about Brooches | An Introduction to History and Style next.